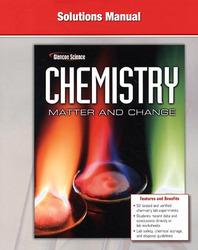 This Solutions Manual is a comprehensive guide to the questions and problems in the SE, including the Practice Problems, Section Assessments, and Chapter Assessments, as well as the Elements Handbook problems, Math Handbook problems, and Supplemental Practice Problems that appear at the back of the book. Each question is restated so you don't have to look back at the text while reviewing problems with students. In addition it supplies detailed solutions of the Practice Problems following the same methods shown in the Example Problems in the text.